FTDNA Upgrade Sale starts now! FTDNA just announced an upgrade sale! This sale is only for existing customers and is not the previously announced upcoming Facebook sale. Click here and log into your already existing account to order. From June 15, 2011 through June 22, 2011, FTDNA will reduce the following prices. To order an upgrade at these special prices members can log into their personal pages with their kit number and password. Click on the "Special Offers" link found on the left-hand navigation bar. ALL ORDERS MUST BE PLACED AND PAID FOR BY MIDNIGHT, JUNE 22, 2011, TO RECEIVE THE SALE PRICE. 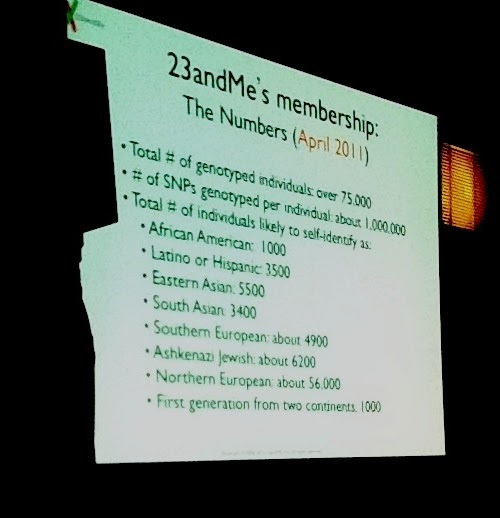 I attended the lectures of 23andMe's Joanna Mountain and FTDNA's Bennett Greenspan at SCGS 2011 Jamboree, as well as participated in the ISOGG meeting's panel discussion. Below are some interesting tidbits that I learned while there. 2. 23andMe customers will be able to sort their matches by mtDNA and Y-DNA haplogroups, most likely by the end of the month. 3. 23andMe customers will be able to report confirmed relationships for their predicted matches. *These numbers are as of April 2011 and, obviously, approximate. JM-"In general, these are non-overlapping sets, but there are some individuals who do not fall into any of these categories." Joanna is "very optimistic" about the future of full sequencing for the Y-chromosome and expects it to happen "very soon", however 23andMe has no plans to offer a separate Y-chromosome sequencing product. 1. The 2011 FTDNA DNA Administrator's Conference will be held November 5th and 6th in Houston. 2. FTDNA has found previously undiscovered mutations in ~10% of all new Full Sequence mtDNA samples. 3. FTDNA sold 200 "Walk the Y" tests during their last sale. So far they have completed 100 of these samples and found 140 new SNPs. The "Walk the Y" tests take five times more plate space than the Full Sequence mtDNA tests. As a result, FTDNA can run only two of these tests per day. 5. FTDNA has shipped out over 207,000 kits since inception and 406,000 kits have been sold by National Geographic. FTDNA has 208,000 unique Y-DNA results and 128,703 unique mtDNA results in their database. 6. FTDNA's Population Finder uses 64 reference populations. I hope you learned something new. I know I did! I have been asked to be on the discussion panel for the SCGS Jamboree 2011 ISOGG meeting today at 5:00 pm along with Bennett Greenspan, Katherine Borges, UCLA Professor John Richardson and Alice Fairhurst to talk a little about DNA testing and this blog. If you are attending Jamboree this year, please join us. I spent most of the day yesterday at Jamboree at the joint ISOGG/SCGS DNA Special Interest Booth chatting about my favorite subject, DNA testing, with the nice genealogists in attendance. I was happy to see that FTDNA's Bennett Greenspan's lecture was added to the schedule yesterday afternoon, so I attended then instead of having to get up at the crack of dawn today to attend his 8:30am lecture. (I'm driving back and forth.) It's amazing- no matter how many times I hear Bennett talk, I still learn something new! After the exhibit hall closed, I stayed late to attend the Geneabloggers' ice cream social hosted by Geni and met a lot of my fellow geneabloggers. It was especially a pleasure to meet fellow genetic genealogist and blogger Joan Miller of Luxegen and, of course, Geneablogger's Thomas MacEntee. I am looking forward to hearing 23andMe's Joanna Mountain's lecture today at 11:30 and I am hoping that there will be some interesting tidbits to share with you all. Gotta get on the road now. Hope to see you there! One Year Anniversary of "Your Genetic Genealogist"
I can hardly believe that it has been one year already since I started blogging about my favorite subject - personal genomics. I could never have guessed how fulfilling and exciting it would be. During this time, this blog has logged 38,591 page views from 102 countries. 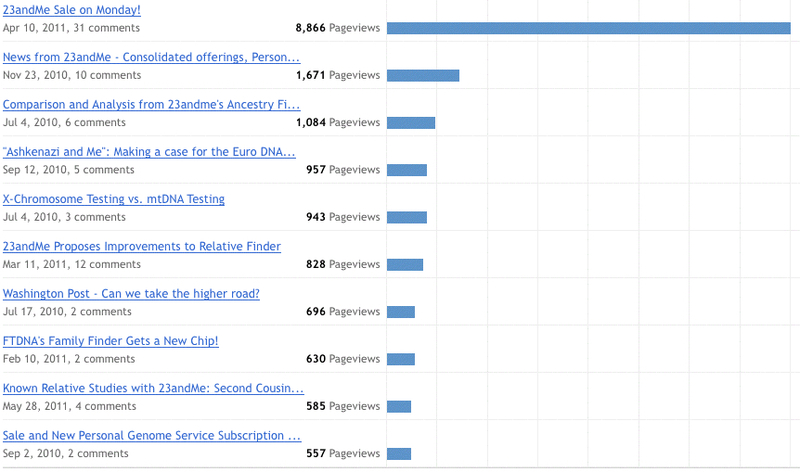 23andMe is, obviously, a very popular subject since my most frequented post was about 23andMe's last sale with 8,866 page views (the vast majority of these in only 36 hours). 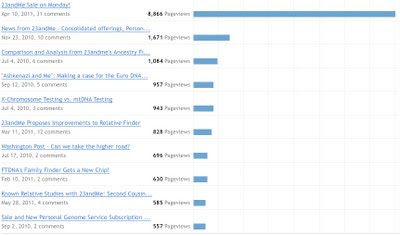 It is encouraging to see that my recent post on second cousin comparisons from my series "Known Relative Studies with 23andMe" is already in the top ten even though I wrote it less than two weeks ago. (Since slightly over 20% of my visitors come from Google, many of my posts continue to be read long after their publication.) I will be writing a lot more installments for this series, so it is good to see that it is well-received. I haven't been able to write as much as I originally intended nor as much as I would like. 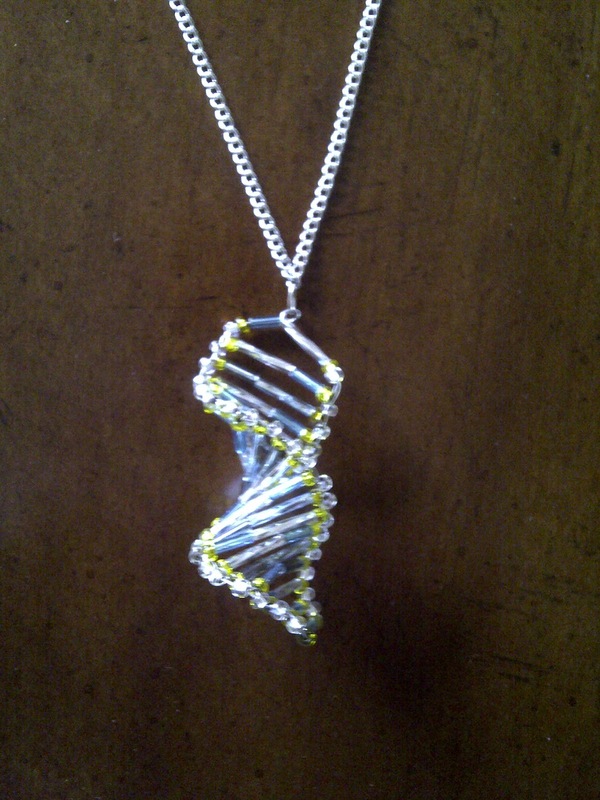 Hopefully, that will change in the second year of "Your Genetic Genealogist". I am confident that there are a lot of exciting discoveries in store for all of us and I look forward to sharing them with you.